Gokyo Valley Trekking is famous trekking route in Everest region. The route offers you mesmerizing Himalayan scenery including Highest peak of the world “Mt. Everest, Mt. Lhotse, Mt. Nuptse, Mt. Amadablam, Mt Pumori, Mt Thamserku, Island peak etc.Gokyo is a trade centre where the Sherpa people run lodges to provide the best services to the trekkers.Gokyo is situated by the side of Ngozumba glacier, thebiggest glacier of Nepal. You climb a steep rocky inclined into the valley by the side of the glacier, passing the first of the holy lakes. You soon arrive at the second of the lakes, crossing the path which heads across the glacier to Cho La your route to Lobuche and Everest, later in the trek. The third lake is known as Dudh Pokhari and on its eastern shore is the settlement of Gokyo. Walking by the side of the lake, the scenery is magnificent with the summits of Cho Oyu and Gyachung Kang reflected in its emerald green waters.You can make a side trip to Firth Lake via Forth Lake. This day is rest day to allow your body to acclimatise. Namche is a growing town tucked into a neat little valley, there is some interesting museums and shops, internet and a sauna, Shyangboche airstrip, (3790m) the highest in the world nearby is the Everest View Hotel for stunning views. Trek from Namche Bazaar to Thame [3739m] and it takes about five hours. From Namche the route turns west and the trail is almost level as you head up the Bhote Koshi Valley, once a popular trading route into Tibet. Along the way you pass many prayer flags, mani walls and carved stones, all indicative of the Tibetan Buddhist culture of this area. After descending to the Bhote Kosi the trail climbs steeply to Thame. From here there are good views of the peaks of Teng Kangpoche and Kwangde and to the north is the Nangpa La, the pass leading to Tibet. Thame Gompa is situated above the village overlooking the valley and is the site for the spring celebrations of the Mani Rimdu festival. Trek from Thame to Khumjung [3790m] and it takes about five hours. You retrace your route down the Bhote Kosi Valley towards Namche and branch off to follow a quiet trail to Khumjung. It is a picturesque village, which also has its own Gompa at the top end of town. 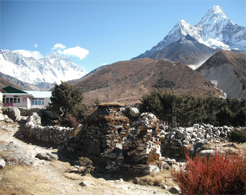 Here you can have excellent views of Thamserku, Kantega and Ama Dablam. Trek from Khumjung to Dole [4040m] which takes about five and half hours. Soon after leaving Khumjung the trail climbs to a large chorten on top of a ridge. This ridge descends from Khumbila, a 5734m peak, said to be the abode of the patron God of the Khumbu region. The trail descends slightly towards the Sanasa and then trail ascends up to Mongla (4000m.). From here, you can see panoramic views of various mountains. You trek steeply descend passing through Phortse Tenga and from there, the trail climbs steeply to Dole, through rhododendron and birch forest festooned with hanging mosses and lichens. You can enjoy delicious meal at Phortse Tenga(3650m.). Trek from Dole to Machhermo [4410m] and it takes about five hours. From Dole you climb steadily along the side of the valley, where the small and thorny bushes give way to scrub juniper as the altitude increases. The trail passes many summer settlements, which are used when yaks are taken to these pastures to graze in the summer months. Ahead of us are excellent views of Cho Oyu, while back down the valley are the peaks of Kantega and Thamserku. This is a short day and you will arrive at Machhermo in time for lunch. Trek from Machhermo to Gokyo [4750m] which takes about four and half hours. Today you head for the lakes at Gokyo. You follow a very scenic path to Pangka and then descend slightly, following one of the melt­water Rivers, which flow down the west side of the Ngozumpa Glacier. You climb a steep rocky inclined into the valley by the side of the glacier, passing the first of the holy lakes. You soon arrive at the second of the lakes, crossing the path which heads across the glacier to Cho La (5420m.) ­ your route to Lobuche and Everest, later in the trek. The third lake is known as Dudh Pokhari and on its eastern shore is the settlement of Gokyo. Walking by the side of the lake, the scenery is magnificent with the summits of Cho Oyu and Gyachung Kang reflected in its emerald green waters. Rest day at Gokyo and excursion in and around Gokyo valley. Gokyo is a trade centre where the Sherpa people run lodges to provide the best services to the trekkers.Gokyo is situated by the side of Ngozumba glacier, the biggest glacier of Nepal. This day you can make a side trip to Firth Lake via Forth Lake. Trek and climb from Gokyo to Gokyo Ri [5340m] & Trek back to Machhermo (4410m.) via Gokyo village and it takes about six hours. Gokyo Ri looms above the village on the northern edge of the lake and you leave camp just after first light, following a steep path up the hillside. As you climb, the summits of Everest, Lhotse and Makalu slowly come into sight and the view from the summit of Gokyo Ri itself, is one of the finest to be had in the Everest region ­ some say it is even better than that from Kala Patthar. After lunch it is a short walk to the village of Machhermo. Trek from Machhermo (4410m.) to Namche Bazaar (3440m.) which takes about six hours. The trail gently descends to Dole and then starting descending steeply to Photse Tenga (3650m.) passing through rhododendron forests. Then the path immediately ascends steeply to Mongla Danda (4000m.) and gently descends up to Kyanjoma (3500m.) following small ups and down to the destination. Trek from Namche to Lukla [2800m] and it takes about five hours. Your final day’s trekking follows the Dudh Kosi back down to Lukla. This last evening in the mountains is the ideal opportunity for a farewell party with the Sherpa guides and porters, where you can sample some chhang, try Sherpa dancing and look back on a memorable trekking experience. Fly from Lukla to Kathmandu. You take an early morning flight back to Kathmandu. In the evening we will drive you for farewell dinner with cultural dance. * Government licensed English speaking Guide and Porters to carry your luggage during the trek (1 porter Between 2 Person basis), their food, accommodation, salary, insurance, equipments, medicine. * Lunch and dinner during Kathmandu Stay.